One of my customers has figured out the following amazing and practical solution. "I’m just a beginner in bookplate collecting, but when I started I realized I needed to find an easy way to display them. I’m not the kind of serious collector that keeps them in binders, particularly since I don’t have very many. The challenge was to find a way to allow people to enjoy the plates without having to continuously get them framed and hung on a wall. I have very limited wall space, plus that would rapidly become overwhelmingly expensive and impractical since I acquire new ones all the time. My answer was to use frames that sandwich the plate between two halves of acrylic plastic and that are held together by tiny powerful magnets. These frames stand up on their own accord so I can place them in front of books on my bookshelves (or on any flat surface). I can keep adding new ones as long as I have shelf space. Also, I wanted the bookplates to be visually connected to the idea of books and I like how the plates seem to “float” in front of the books. 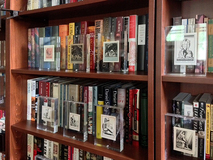 The acrylic is transparent so the books are still visible behind them and remain accessible. 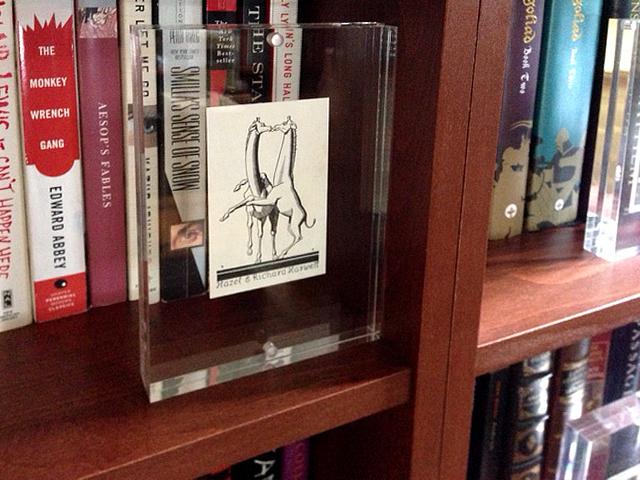 In this system, the bookplates aren’t harmed (as long as they aren’t placed in direct sunlight). No adhesive or tape is used so they can easily be removed. They are held in place by the pressure from the little magnets, which hold the plates pretty tightly and keep them perfectly flat. They don’t slide around. 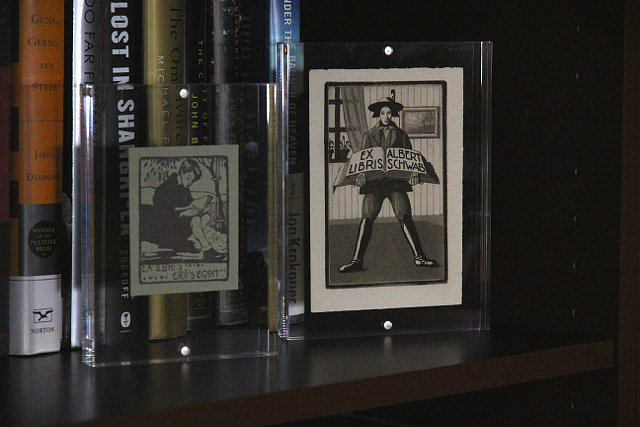 These frames also have the benefit of being able to stand either horizontally or vertically, depending on the shape of the bookplate. I buy the frames at a store here in the US. 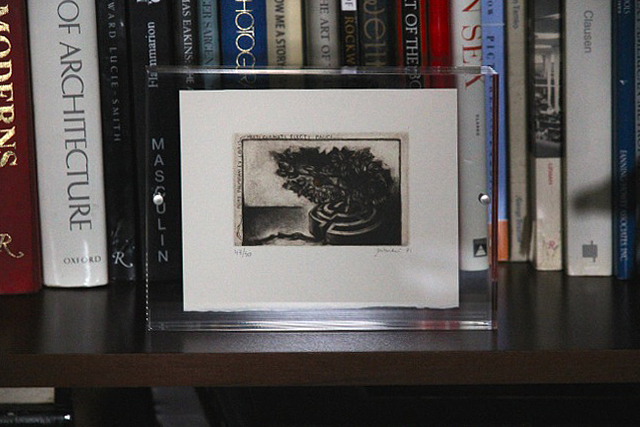 They come in different sizes: 4” x 6”, 5” x 7”, 6” x 8”, and 3” x 3”. I’ve included a picture of the 4” x 6” side by side with a 5” x 7” to show the difference. 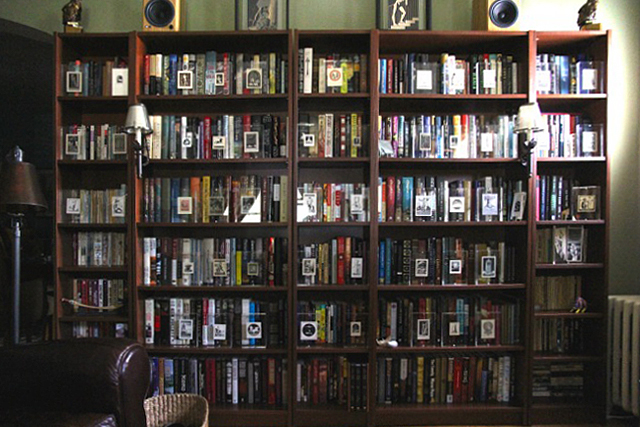 All of the frames on the big bookcase are the 4” x 6” version and are all Rockwell Kent plates. I’ve kept all the Kent plates together; everything else is on other bookcases. I wanted to keep the Kent portion distinct so it seems like a coherent collection. The good thing about this system is that it is infinitely expandable and adaptable. Plates can be grouped in any way by size or theme or artist, moved around, or continuously refreshed from a collector’s archive. This system could also be used for any small paper ephemera, such as postage stamps, bookmarks, etc." You can find acrylic magnet frames like these in framing or design shops, decoration stores, etc., not only in the USA but also in many European and Asian towns. You'll find the addresses on internet under 'magnetic photo block, 'acrylic magnetic photo frame' or something like that. Thanks to Kevin Fry, Arlington, Virginia, USA, for the instructive text and photographs.